How do we find super reefs? On coral reefs around the world, billions of tiny creatures are working around the clock to build “underwater rainforests” that are among the most diverse and important ecosystems on our planet. Reefs support almost one-fifth of the global human population; protect thousands of miles of coastline from waves, storms, and tsunamis; and are home to one quarter of all ocean species, including 6,000 varieties of fish. But the reefs, and the creatures that build them, are in peril. The relentless warming of the global oceans is killing them at an alarming rate, with the potential for further losses likely and extinction of reefs and reef species a real possibility. How do we reverse this trend before it’s too late? The answer lies with “super reefs,” coral reefs that have evolved to be naturally resistant to ocean warming. These scientific marvels offer hope for the future as climate change survivors and as seedbeds for the creation of new, more resilient coral reefs. To date, WHOI scientists have used a combination of physical and biological surveys, coral core sampling, and genetic analysis to identify Super Reefs in the Central Pacific, parts of Thailand, the inner Rock Islands of Palau, and within the northern South China Sea, and models predict that many more exist worldwide. But even climate-resilient super reefs are vulnerable to development, pollution, dredging, and overfishing. Our most pressing task is to locate them and ensure their protection. Collecting a skeleton core does not hurt the coral. 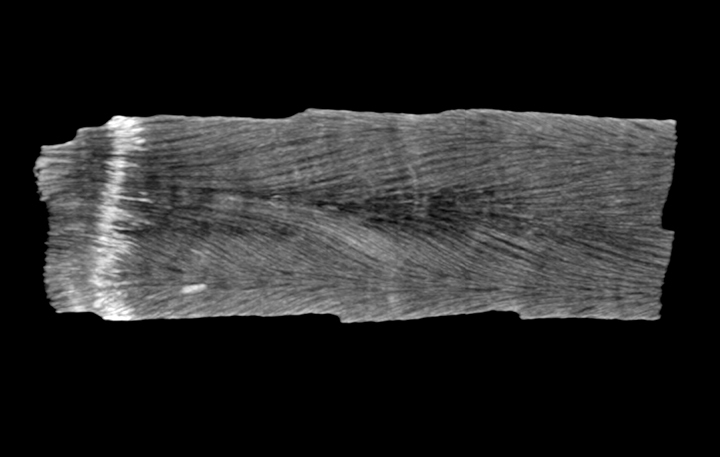 Skeletal core with a stress band at the top of the core that formed during the 2010 El Nino. Shallow and lagoon reefs on Dongsha Atoll in the South China Sea bleached in 2015, but corals in the deeper, fore-reef community survived because they were cooled by a phenomenon known as internal waves. Fortunately, a successful example exists to help us identify and protect super reefs, in the form of the 157,262 square mile (408,250 square kilometer) Phoenix Islands Protected Area (PIPA)—the first marine protected area (MPA) to target protection of climate-resilient coral reefs. Now we plan to replicate this model across the Pacific Ocean, rippling out from the Central Pacific to create inter-connected “Zones of Regeneration,” where healthy coral reef ecosystems can thrive. One example is Tuvalu, which is located in the ecologically important central Pacific equatorial zone and adjacent to the PIPA. The leadership of Tuvalu has committed to creating MPAs and overall management plans to protect their entire exclusive economic zone (EEZ) in collaboration with neighboring countries and the Super Reefs project. Further scientific research will be conducted in conjunction with several robust multilateral agreements and frameworks concerning the oceans that currently lack key data to guide policy makers. One is the Pacific Oceanscape (PO), the largest conservation initiative in history. The PO is administered through the 17-nation Pacific Island Leaders Forum (PIF) and covers an area larger than the surface of the moon. Another is the Commonwealth Blue Charter administered by the Commonwealth Secretariat (CS). Collectively, Commonwealth countries govern approximately 38 percent of the total area that falls under Exclusive Economic Zone on the planet. Under the Blue Charter, these nations are committed to achieving goals laid out in the UN Sustainable Development Goal 14 (Conserve and sustainably use the oceans, seas and marine resources for sustainable development) and has agreed to convene its 53 member counties to do so. 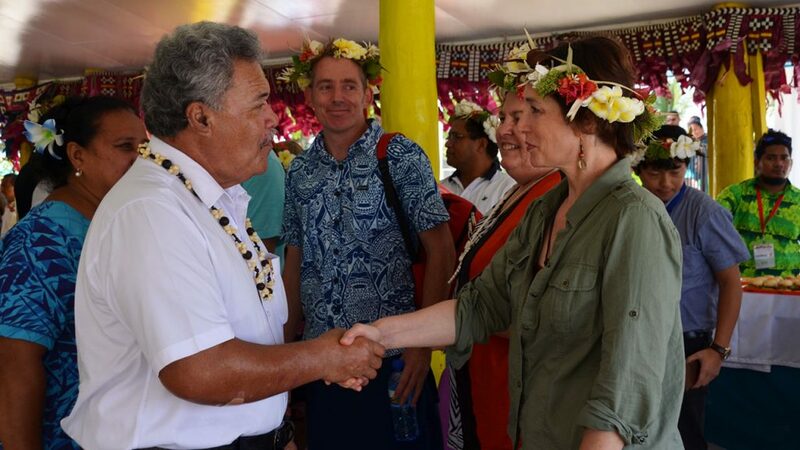 WHOI scientist Anne Cohen greeted at Tuvalu International Airport by Prime Minister Sapoaga prior to the start of the 8th Polynesian Leaders Group Summit in 2018. The principles that underpin the Super Reefs project have unique connections and influence with both the PO and the CS. Drs. 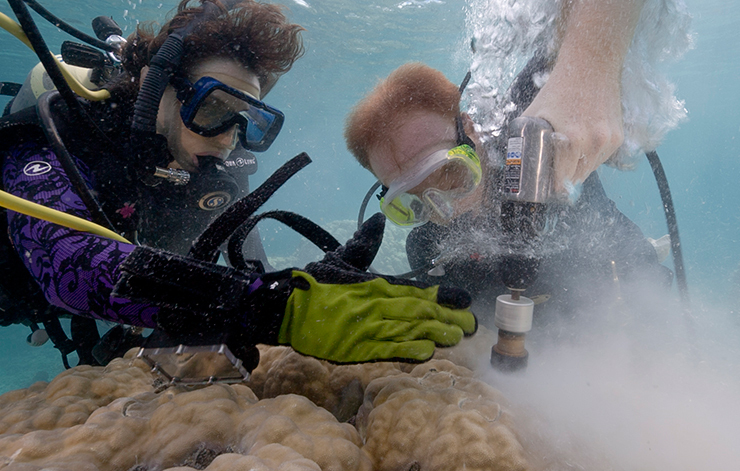 Anne Cohen (WHOI) and Sue Taei (CI) introduced the Super Reefs partnership at the 8th Polynesian Leaders Group (PLG) Summit in early 2018, resulting in the immediate incorporation of super reefs into the Amatuku Declaration, a commitment by the nine-nation PLG to locate and protect their climate resilient super reefs. In addition, Dr. Greg Stone, a co-founder the Phoenix Islands Marine Protected Area, is now an advisor to the Commonwealth Blue Charter regarding the information and management plans to be conveyed to the Commonwealth countries, further improving our ability to protect critical reef sites. Our goal is to establish a global network of super reefs across the tropics that will become a repository of healthy corals. Once carbon emissions and global temperatures have stabilized, these corals could then be used to recolonize dead reefs around the world. Healthy coral reefs signal a healthy ocean, and a healthy ocean is paramount to the future of all life on Earth. Sound science, creative new approaches, and collective management offer hope for all reefs and for all who depend on them.